Prairie Du Sac, WI (Grassroots Newswire) February 19, 2009 – Bucking the trend of a down economy, Culver’s® Restaurants is on the move. The company’s confidence and commitment to growth has led to increased sales, new restaurant openings, and an aggressive marketing campaign launching nationally around this year’s Academy Awards®. Known for its ButterBurgers®, fresh frozen custard and commitment to treating guests with unexpected kindness, Culver’s is proof that good companies grow even in challenging times. Culver’s, celebrating its 25th anniversary this year, ended 2008 with nearly a 10 percent increase in overall sales. While its roots are in the Midwest, the company is spreading across the country with 23 new stores in 2008 – two of which opened in Phoenix, a new market for Culver’s – and 20 more planned for 2009. Now, Culver’s is pulling out all the stops with a new marketing effort chronicling the “Culverization of the Nation.” Culverization began a year ago as the story of irresistible goodness and warm hospitality you’ll always find at every Culver’s restaurant was told. The company’s new marketing push seeks to extend Culverization across the nation, converting millions with delicious food and extraordinary hospitality. The new campaign launches with Culver’s first-ever national TV ad, a 60-second commercial that will air Feb. 22 during the live “red carpet” show on E! preceding the Academy Awards. The 60-second commercial will also be shown during the Oscars broadcast on ABC affiliates in select markets, after which a series of 30-second spots will extend the campaign throughout 2009. 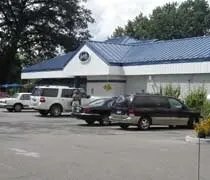 “We’re making a strong statement that Culver’s refuses to participate in the current economic downturn,” said Chris Contino, Culver’s vice president of marketing. “We honor our guests by doing what’s right for them. That’s something we’re proud of and believe helps us continue to grow despite challenges. In the new TV campaign, created by the Chicago office of MARC USA, there’s a lone skeptic – a fellow who hasn’t yet been Culverized. Mystified by what he’s seeing at Culver’s, he decides to investigate. To him, tasty food cooked to order and brought to your table or your car with a friendly smile is against the natural order of the universe. The TV spots follow the mystified investigator as he observes Culverization. He sees it with his own eyes, but he doesn’t believe it. In one spot, he sees his grouchy neighbor become a model citizen once he has been Culverized. In another, he finds that the one thing you can’t get at Culver’s is a frown. In yet another, he’s so unnerved by the niceness all around that he runs off with a fresh, hot order. Convinced there’s something unnatural going on, he’s desperately trying to disrupt the experience. Of course, he fails every time. In addition to the new TV spots, the campaign will include radio, a new crop of Culverisms (the quirky sayings on all point-of-sale and packaging), social media and grassroots events. 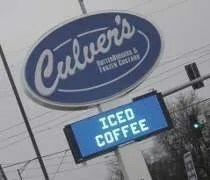 Culver’s also has a growing following on Twitter (@getculverized) and a Facebook fan page. It’s always fun when you take people some place new. J and I have been eating at Culvers for a few years and love the food..well, love it as far as fast food goes. My family had only been to Culvers one other time when we lived in Morton, IL and they just got custard, so lunch was something new…and apparently confusing for them. J and I were in Bradley because my brother wanted to take a family portrait for my mom for Christmas. J and I couldn’t get back before Christmas so we did it the Saturday after. The Sears portrait studio made a huge mistake and took a walk-in of 17 just before our scheduled 12:00 appointment. It was 1:30 before we even got our pictures started and 2:30 before we got out of there. By that time, everyone was starving. Even though everyone was hungry, no one wanted to make a decision. Everyone my mom asked, “What do you want to eat?” would reply “I don’t care.” I don’t know what restaurants are in the Bradley/Bourbonnais/Kankakee area, so I left it up to them…even though no one wanted to make a decision. I was looking at my stats today and noticed there were a ton of hits for a post I put up last week about $1 butter burgers at Culver’s. I should have looked at that post. I thought it was tomorrow, but I got an e-mail from J who was excited about those $1 burgers…..and it was today! I scrapped dinner plans and went to pick J up from work. Last year, we waited in line for $1 burgers at Culver’s in Morton, IL and it was totally worth it. In the restaurant business, you’re always told it’s location, location, location. Culver’s of Okemos couldn’t have done a worse job with that. I can’t figure out why they would put a restaurant where they did. It’s down a dark road and there’s nothing around it. We had a helluva time finding it. It wasn’t in J’s GPS. She finally called 411 to get the address, but I had just seen a sign for it near Wal-Mart. So we drive back by the Wal-Mart and I almost miss it. There is no sign outside and the building isn’t lit very well. This store is in a really weird location and we had a tough time finding it. Press Release – $1 Butterburgers!! Just got this press release. I’m pretty sure I know where I’ll be next Tuesday…. 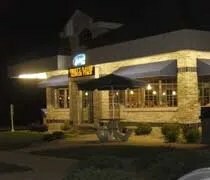 Prairie du Sac, WI (Grassroots Newswire) — Yes, the rumors are true, the juicy, mouth-watering Butterburger™, made famous by Culver’s® Restaurants, is available on Tuesday, Oct. 7, for just $1. The $1 ButterBurger celebration will take place at more than 380 participating Culver’s restaurants in 18 states. Every order can include up to five single ButterBurgers, with the guest’s choice of condiments, for the special one-day only price. As part of Culver’s 2008 Custard Election (Sept. 29 – Oct. 19), an in-store and online voting campaign to select your favorite Democrat or Republican sundae candidate, Culver’s Restaurants are attempting to “buy votes” by driving voter traffic in-store with the second annual $1 ButterBurger guest appreciation day. Culver’s signature sandwich, the ButterBurger, is made from fresh, never frozen 100 percent U.S. beef raised predominantly in the heartland of America, seared on a hot grill and served on a buttered, lightly toasted bun. Please join us Oct. 7 at participating Culver’s Restaurants. Interviews with local franchise partners are available. I love Culver’s custard. There was always a debate at the place I used to work. I prefered to go to Culver’s for “ice cream” but most of my co-workers wanted to go to Cold Stone Creamery. I know they’re not the same thing or even close to the same thing, but given the choice, I would always choose Culver’s. Things got really bad when I moved to an apartment that was within walking distance of one. My girlfriend and I would walk over every now and then for a post-dinner snack.